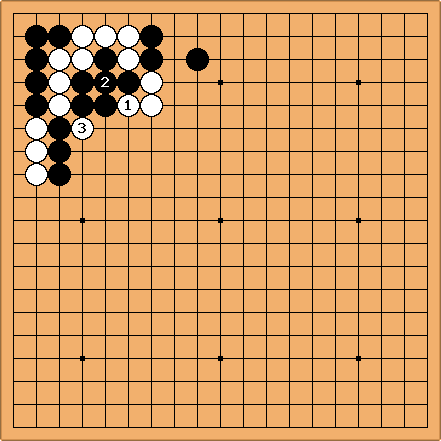 Note: "Turnaround ladder" is not an established Go term. A turnaround ladder is a ladder in which one stone by the ladder is under atari, but if the defender captures that stone, it becomes a squeeze resulting in the same ladder going down another path. 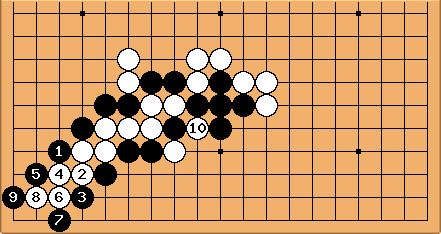 It is hard to say whether a turnaround ladder is a single ladder or two ladders, because although only a single group is captured, players effectively have to read two ladders. In Chinese, such a ladder has been referred to variously as 回纹征, 回龙征, 回头征 and 反征. Character wise, all of these terms hint at "going back" or "turnaround". 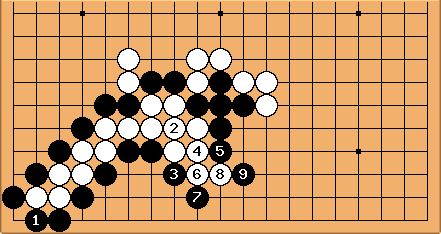 The only way for Black to save the stones is to capture the stones. Since the stones have only two liberties, every move must be an atari. With , White has no choice but to capture at . And so the captured stone becomes part of a squeeze. This ladder continues when and sends White down towards the middle of the lower side. 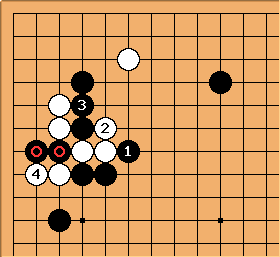 White is still captured. 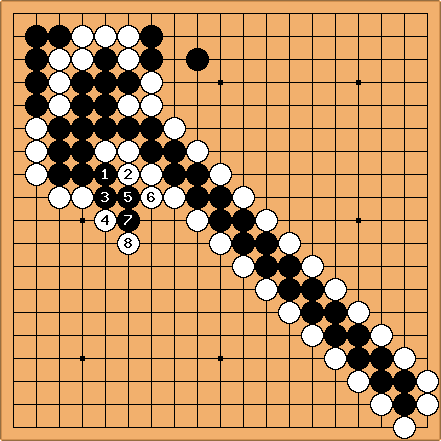 In Tesuji and Antisuji of Go Sakata gives the following example (Example 19). should be at a. Normally we would call it unreasonable, but with the stone in place it may lead to catastrophe. attempts to capture the stones. At first glance it looks like the ladder does not work, because is in atari, and is in line to be in atari next. 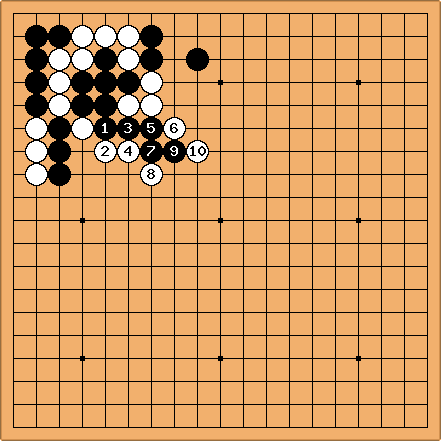 But thanks to , Black can continue the ladder with . can capture , but with the ladder starts up again. If the two ladders are parallel to each other, then such a turnaround ladder may be also called a parallel ladder. 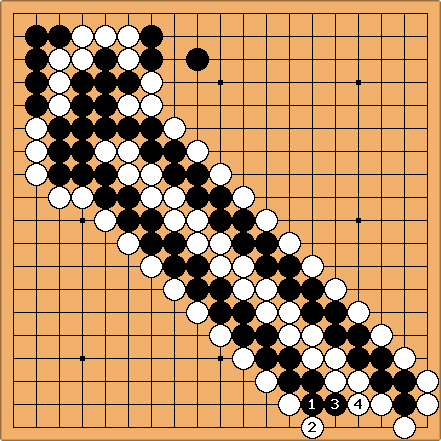 blubb: This indeed is quite the same technique as described as "Spiral Ladder", isn't it. I like this term more, though. "Turnaround ladder" is very declarative about what the ladder actually does. As far as I can see, the only difference to the "Spiral Ladder" examples currently provided at Parallel Ladders is the angle the ladder is bent by the turnaround, and as a consequence, the slightly less complicated followup. If that difference is deemed significant, Spiral Ladders would appear as a special case of Turnaround ladders, otherwise as just the same. 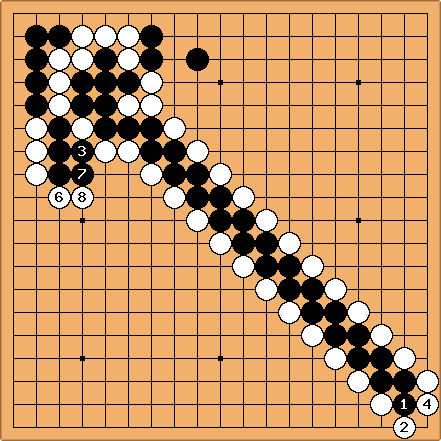 Bill: In my 1974 Japanese paperback edition of Tesuji and Antisuji of Go, Sakata calls the example an oshitsubusu ladder. That does not really make sense. 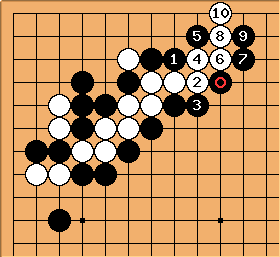 Maybe oiotosu ladder was intended. There is an element of oiotoshi here. Question 1: Does anybody know what the translation was? 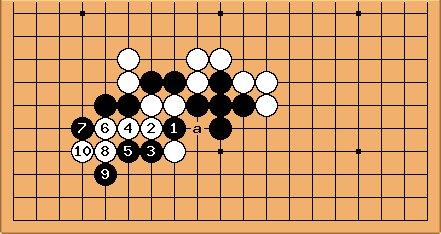 Question 2: Is oiotosu shicho or oshitsubusu shicho standard go terminology in Japanese? 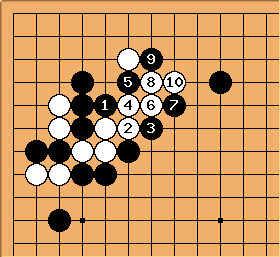 (Later): Segoe has several examples in Go no Chikara wo Tsuyoku suru Hon?. Usually he does not call them anything, but when he does, all the ones I have found he calls guruguru mawashi no shicho. (Which translates into spiral ladder ladder. ;-)) It does not seem like there is a standard Japanese go term for these ladders. 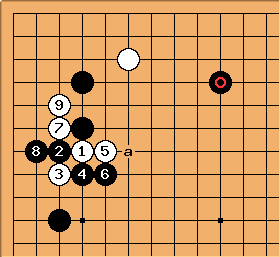 unkx80: The Gobase entry for guru-guru mawashi appears to include elements of loose ladder. On the other hand, I wanted ataris all the way. Perhaps I am not understanding the precise meaning of spiral ladder or guru-guru mawashi. 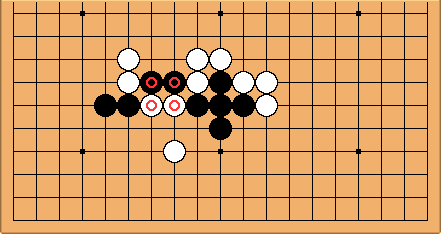 Anyway, if the distinction with "turnaround ladder" is not important, I don't mind merging the two. In any case, the various dual ladder pages are definitely in a mess. I think these pages are definitely due for a massive multi-page WME so that coherent information is presented.